Jesse has been surrounded by aviation since a very young age and grew up in an aviation family. His grandfather was a Major in the U.S. Army Air Force who commanded a squadron of B-29 bombers in the Pacific theatre of WWII. His father, who is also a pilot, owns a collection of small aviation businesses in New England including an FBO in Portland, Maine and an aircraft dealership for the well known Pilatus PC-12 and PC-24. With this rich heritage, Jesse developed a passion for aviation throughout his young years and inspired him to pursue a career in the industry. Jesse attended a small ski academy in Steamboat Springs, Colorado for high school and then continued his education at Bates College in Lewiston, Maine. At age 16 during summer break, he began his flight training at the Portland International Jetport. 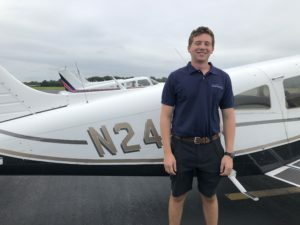 Jesse continued to add on more ratings each year until reaching Certified Flight Instructor just before graduating from Bates with a Bachelor’s in Economics, May 2018. Today, Jesse is a Certified Flight Instructor (CFI/CFII) at the Beverly Flight Center and looks forward to continuing his career in aviation.